Regular vacuuming is useful for cleaning on the surface. However, there are many stains on carpets and upholstery that cannot be simply vacuumed away. Professionals are needed to apply more advanced tools and techniques to clean at and beneath the surface level. The following are a few, common cleaning methods that are used by Fox Valley Carpet Cleaning’s technicians in Aurora and Naperville. Hot water extraction is one of the most popular methods of carpet cleaning. For many property owners, it’s the most effective way to clean carpets and furniture at the deepest levels. The process starts by pre-treating the area with a cleaning solution that penetrates the fibers. Then, hot water is inserted into the fibers and extracted through a high pressure vacuum. Preventing problems is a major aspect of floor or upholstery cleaning. Over-saturation occurs when too much water is applied to the area being cleaned. Some people think that using more water increases the effectiveness of removing stains. In reality, it just requires more power to remove the water and it takes longer to dry the area. 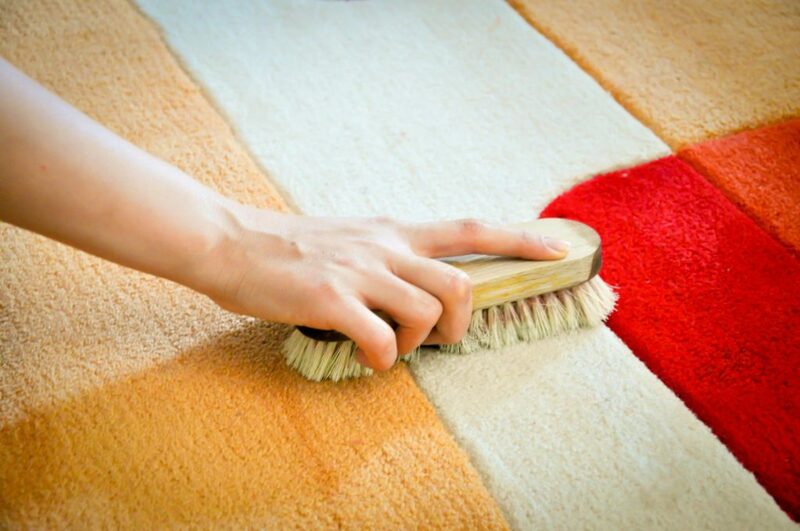 Brushing helps to remove the stains that lie on the surface and deep within the fibers. It’s optional, but it increases the penetration of the cleaning agents that remove stains. After brushing, the solution is left to soak into the fibers for at least 10 minutes or more. Spot cleaning is the work of removing the biggest and most deeply ingrained stains. It involves using a highly concentrated solution and scrubbing the stain off using a hard bristle brush. This technique works for either carpet or upholstery cleaning; however, upholstery comes in different materials, so the cleaning solution must be safe to use on the material. People who do not clean for a living are not familiar with stains. There are different types of stains that require different types of cleaning methods to remove. Removing blood effectively is not the same as removing paint, and some stains if left too much cannot be removed at all. For most people, carpet cleaning on their own is out of the question. They get tired just moving a couch a few feet to the side, so they cannot handle an hour of deep cleaning. It’s recommended that any home, apartment or business owner rely on professional cleaning solutions. Cleaning companies provide a wide range of services that include discounts. A free consultation is available for clients of Fox Valley Carpet Cleaning in Aurora and Naperville and the surrounding areas.